Scrub the potatoes and dry them thoroughly. Rub the outside of the potatoes with canola oil and place directly on the oven rack. Bake for 40 to 60 minutes, or until potato is tender when pierced with a knife. Remove from oven and let sit for 5 minutes or so, until cool enough to handle. Increase oven temperature to 450 degrees F.
Slice each potato in half lengthwise. Using a spoon, cookie scoop or melon baller (any will work), scoop out the insides of the potato, leaving a little bit of potato clinging to the skin (about a ¼ inch). Combine the melted butter with 2 tablespoons canola oil. Brush both sides of the potatoes with the butter/oil mixture and then season with salt and pepper. Place the potatoes on a baking sheet face-down and bake for 10 minutes. Flip the potato halves over and bake for an additional 10 minutes (the edges of the potato skins will start to turn golden brown). Remove the pan from the oven and sprinkle the insides with the shredded cheese and bacon. Return to the oven for about 5 minutes, or until the cheese is melted. Switch to broil for an additional minute or two, if desired. Use tongs to transfer the potato skins to a serving platter. 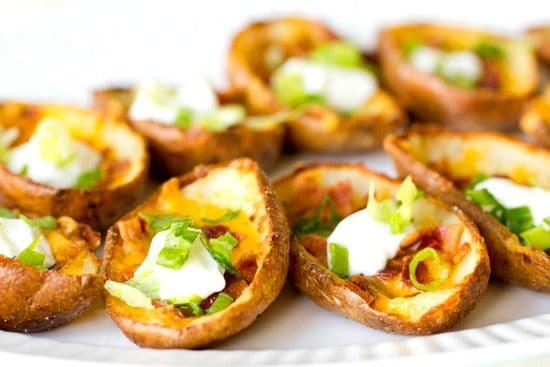 Add a dollop of sour cream and sliced green onions to the potato skins and serve immediately.